The assignment calls for the creation of 2 functions, one that can calculate the delay between two signals And one to 'calculate the cross-correlation function between two signals, and plot the cross-correlation function with the correct axis'. We've chosen to do both in one function. 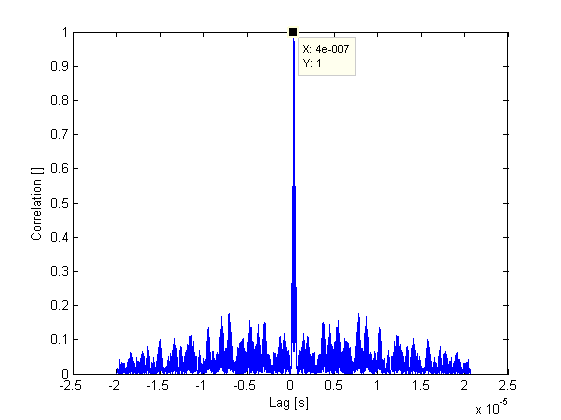 plot(tlags, corramp); %Plot the correlation. 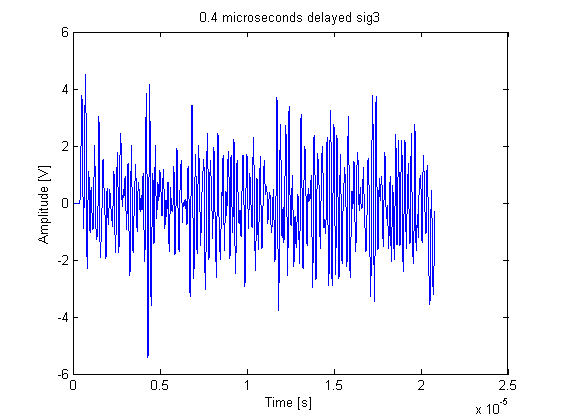 And returned to the matlab workspace is the correct delay equal to 0.4 microseconds, also evident on the above figure. We were given a dataset, corresponding to 10 pulse-echo signals measured with a sampling frequency at 100MHz, a velocity at 1540 m/s and finally a 200 μsec time spacing in between each measurement. As in part two, cross correlation enable us to calculate the time delay ts and thereby finding the blood velocity. 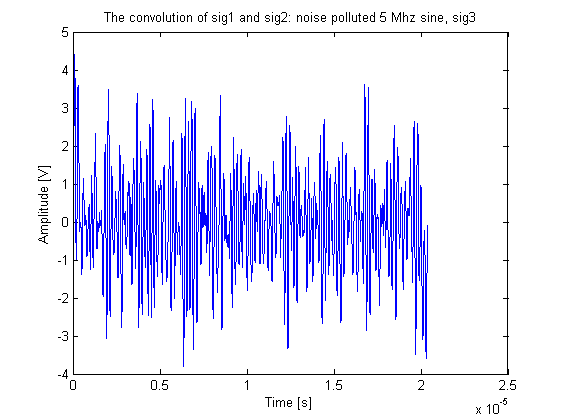 Exercise 4 examines the velocity found when the RF signal from excersise 3 is divided into 2 microsecond segment. In exercise3 we loaded plug_flow.mat, probably data simulating plug flow, a model in which the velocity of fluid in a pipe is constant across any cross section. 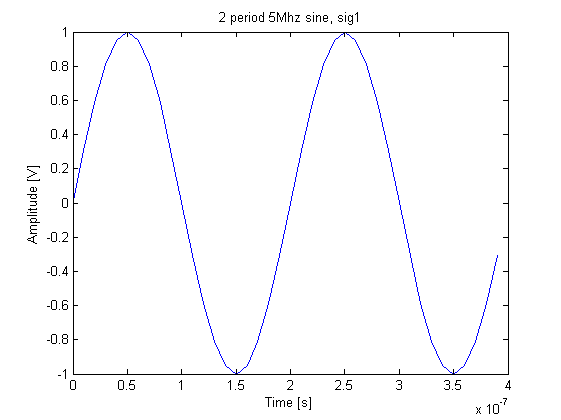 Drawing on the theory in exercise 5 we relate the segments of RF data to the depth of the recording. 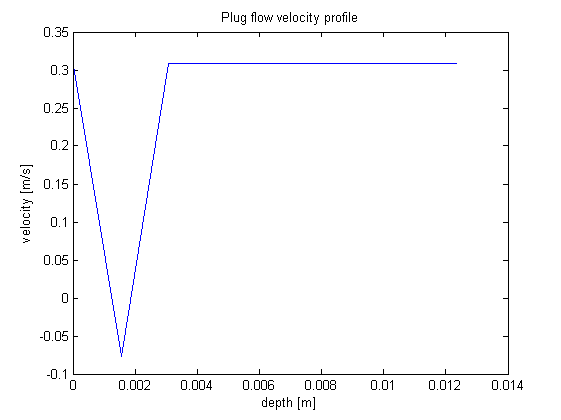 The following code was used to segment the RF data and plot the velocity profile. In which it seems there is an error. Obviously the 2nd measurement should have been the same as the others, assuming plug flow. 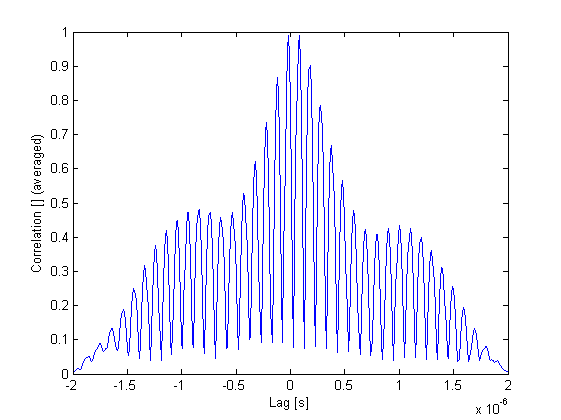 Two distinct peaks on either side of zero are observed. Their amplitudes are almost equal, but the negative is slightly bigger. The 8 other measurements have their max at the positive peak which results in the velocity of 0.308 m/s. The same routine as in exercise 4 is used to find the velocity as a function of depth. 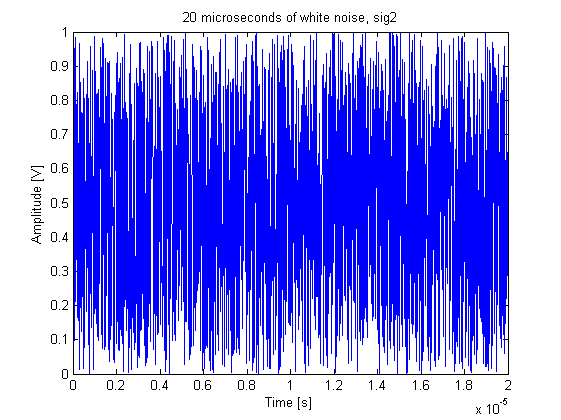 The data is divided into segments of 2 microseconds, in which mean velocities are calculated. First a time-, and an indices-vector are made with elements corresponding to the edges of the intervals or segments. Afterwards the meanvelocities in each interval are calculated in a for-loop using findmeanvel.m. The depth corresponding to the time vector is made using the relation $d=tc/2$. The d-vector therefore consists of depths relating to the edges of the intervals from which the mean velocities are calculated. 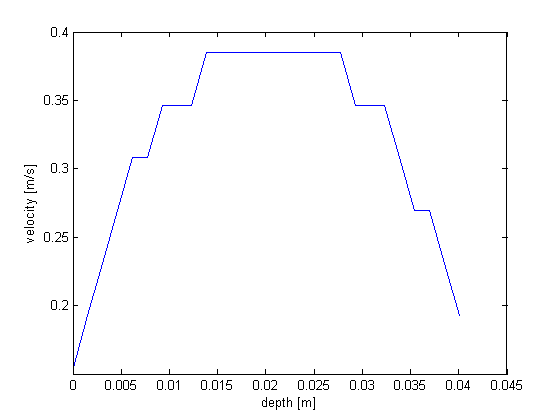 To plot the mean velocities as function of depth, each velocity must relate to a specific depth. We have defined each velocity to relate to the left edge in the interval from which it is calculated.